Extend from $.fn.datagrid.defaults. Override defaults with $.fn.propertygrid.defaults. The propertygrid provides users an interface for browsing and editing the properties of an object. The property grid is an inline editing datagrid. It is fairly easy to use. 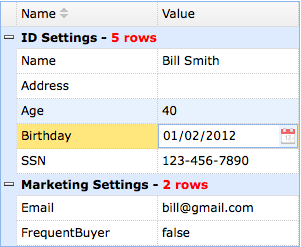 Users can easily create a hierarchical list of editable properties and represent any data type of item. The property grid comes with a built-in sorting and grouping features. Create a propertygrid in markup. Notice that the columns have been built-in and don't need to declare them again. Append a new row to propertygrid. value: the field value to be edited. group: the group field value. editor: the editor while editing property value. The properties extend from datagrid, below is the added properties for propertygrid. rows: the rows belong to its group. The methods extend from datagrid, below is the added methods for propertygrid. value: the group field value. rows: the rows that belong to the group. startIndex: the start index in all the rows. expandGroup groupIndex Expand specified group. If the 'groupIndex' parameter is not assigned, expand all group. collapseGroup groupIndex Collapse specified group. If the 'groupIndex' parameter is not assigned, collapse all group.